"A Weekend with Pablo Picasso"
If you are an actor, sometimes you run across something—a role in a play, a character from history—that you just seem destined to make yours. It’s someone you love or understand or you identify with intimately or have great respect for—actually, probably all of these things. And then you recognize that not only can you make the character your own, but you can make a decent living embodying that character just about anywhere you find a willing audience. Herbert Siguenza has found that character, and it’s hard to imagine that he would have a problem finding willing audiences. His character is Pablo Picasso. 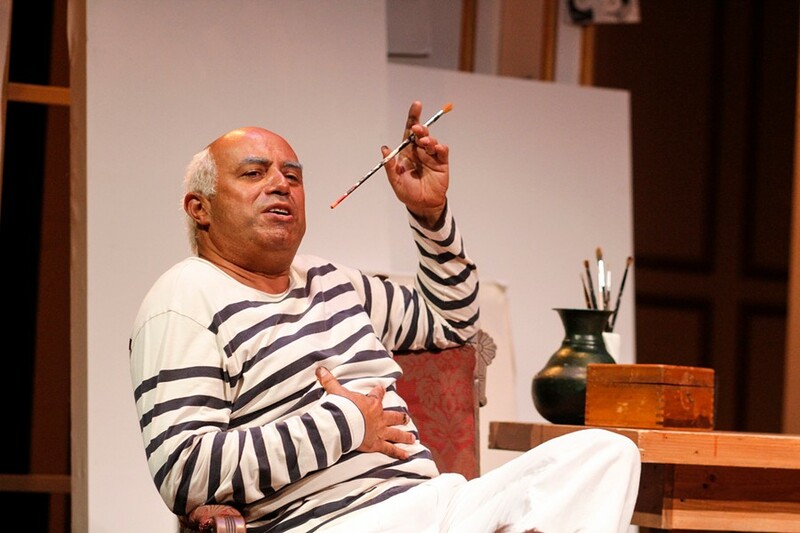 Arizona Theatre Company has opened an exhibit of the artful Picasso a’la Siguenza in an entertainment called “A Weekend with Pablo Picasso,” which Siguenza developed based on the writings of Picasso. A founding member of the performance group Culture Clash, and a quite impressive visual artist himself, Siguenza, with help from friends and directors and his own study of the famed artist, has pieced together a tribute to one of the most respected visual artists of the 20th century. And he is now touring the show nationally. It’s a rather confounding production, because although Siguenza certainly gives us a lively portrait of the artist, it is little more than that. It has the quality of an elaborate sketch—which Siguenza quite magically produces onstage several times—rather than a carefully deliberated story, with the qualities of a play. But because Siguenza is a lively, enthusiastic, funny and downright charismatic creature, the piece works. We don’t learn as much about Picasso as we learn about Siguenza’s love and respect for Picasso. Siguenza uses the convention of Picasso’s being charged by his agent to create six paintings in one weekend. That drives what story there is. Siguenza/Picasso discovers that we, the audience, are there to witness the goings-on, and he good-naturedly makes us a part of the process. He muses, bathes, paints, grouches, talks with the baker who shares some artfully made bread, dreams fitfully and generally shares some Picasso-esque platitudes throughout. There are thoughts on Picasso’s politics, his friends, his passions, his family, all unfolding during this compactly compressed weekend in 1957 in southern France. Besides the effervescence of Siguenza, there are some really wonderful visual effects, as one would hope to be the case when dealing with such an artistic giant. There are sketches and paintings, which Siguenza himself has produced, and the set actually springs to life from time to time, not only delighting us, but underscoring the fact that art not only reflects life, but creates it. The evening is really quite entertaining, and at moments, enchanting. And kudos to ATC for offering two performances in Spanish. Siguenza claims he has had no formal theatrical training, and someone who has would say this is apparent. But he does have undeniable appeal and generosity of spirit as he welcomes us to his flat, which he has filled with the life and humanity and creative passions of Pablo Picasso. We are hard-pressed not to let his joy become ours.